Stores reference 8B/2515. 1944 dated. 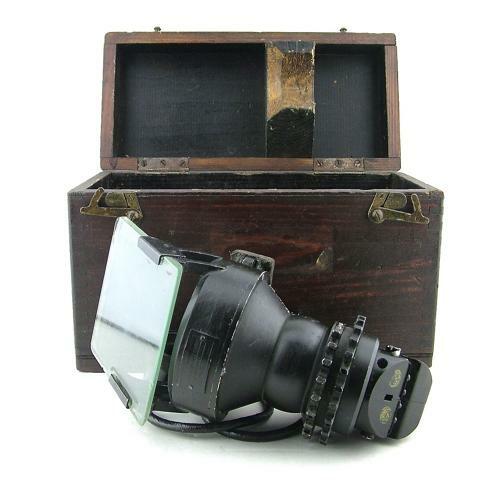 This classic Reflector Gun Sight was adopted for use in 1941 and used on various Spitfire variants including the Mk.IID, VB, VC, VI, VII & IX, the Sea Hurricane, Mosquito, Beaufighter, Tempest, Typhoon, 339E Buffalo and Lysander (gunner). It is complete with wiring loom/plug and bulb holder. The paintwork is good bar some loss and chipping on exposed edges and minor verdigris. The sight is fitted with original glass in good overall condition apart from some chipping/loss at the edges. The rubber cushion has a slightly crusty appearance but is complete and is actually quite supple. The loom, plug and bulb holder are all complete/good but there is wear at the exit point of the bulb holder. Well marked data plates. No bulb fitted but the cross hairs of the sight can be illumintated with a torch - (hard to photograph). A good / good '+' original example contained in its original wooden transit case. Stock code M22987.